Is Eli Lilly Being Wise About YZ? How wise is Lilly being with its "YZ" patent cliff years? It's now more than halfway through the period that Eli Lilly (NYSE:LLY) has called its "years YZ," a term describing the years spanning from 2011 to 2014. The company knew that this period would be particularly challenging as several of its top drugs lost patent protection. In April 2011, Lilly CEO John Lechleiter laid out the company's plans to navigate the difficult period. How have these plans worked out so far? Let's look to see if Lilly is being wise in how the company is handling years YZ. One of the first things that Lechleiter pointed out in his 2011 speech was Lilly's efforts to control costs. He noted then that the company was well on its way to achieve cost reduction goals set a few years earlier. How has Lilly done since that point? 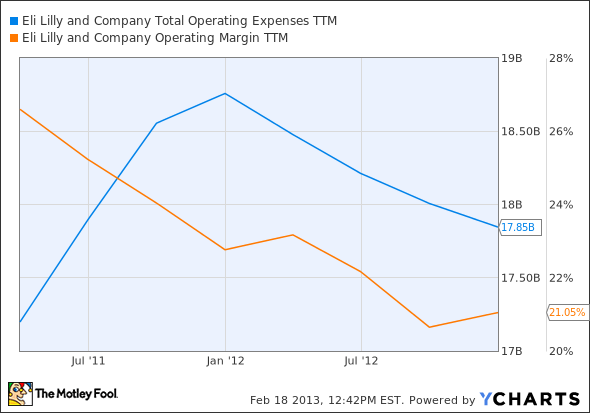 LLY Total Operating Expenses TTM data by YCharts. Operating expenses continued to climb through the end of 2011, but then began to come back down. That's the good news. The bad news is that operating margins have steadily declined so far in the YZ years. In his 2011 speech, Lechleiter took a swipe at other pharmaceutical companies by stating that some of Lilly's "peers are shifting direction, moving away from innovative drugs or staking their future on consolidation." He emphasized that "this is not our path at Lilly." Lechleiter's comments about consolidation likely referred to Pfizer's (NYSE:PFE) acquisition of Wyeth and Merck's (NYSE:MRK) buyout of Schering-Plough. The remark about peers "moving away from innovative drugs" perhaps was an early hint at Abbott's (NYSE:ABT) spin-off of AbbVie (NYSE:ABBV) as a separate business, which was publicly announced several months later. 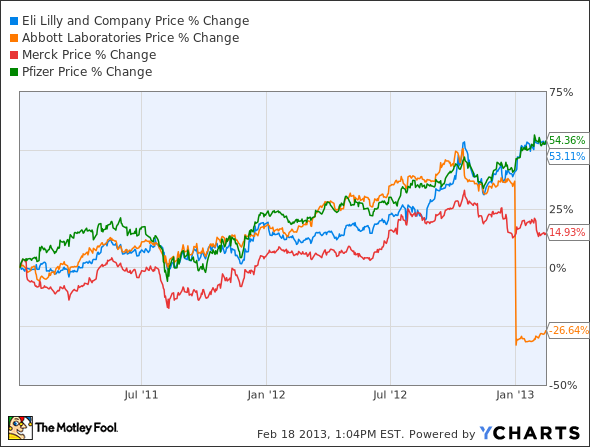 How have these moves by Pfizer, Merck and Abbott paid off for investors compared to Lilly's stay-the-course approach? Judging by share price appreciation since 2011, Lilly's approach has worked out pretty well for shareholders. Pfizer won overall in stock performance, but just barely. Abbott isn't too far behind Lilly. (Note: Abbott's price dropped in 2012 in connection with the AbbVie spin-off.) Merck's performance wasn't so great. Lilly's stick-to-your-knitting philosophy didn't totally rule out smart acquisitions, though. The company announced just weeks prior to Lechleiter's April 2011 speech that it was buying Janssen Pharmaceutical's animal health business. However, true to his word, Lechleiter has not led the company to any major acquisitions so far in the YZ years. In early 2011, Lechleiter pointed to three growth areas for the company: Japan, emerging markets, and animal health. How have these panned out for Lilly so far? As for Japan, growth numbers look all right. Lilly reported volume growth in the country of 14% for 2012. One important factor is that the company still retains patent protection for Zyprexa in Japan. However, lower prices for several drugs translated to total Japanese revenue growth of 7%. Lilly's international growth outside of developed nations isn't as strong. The company reported zero volume growth in these regions in 2012 with a 5% decline in total sales. However, Lilly expects solid growth in 2013, particularly in China. The biggest success story has been animal health. Total revenue in 2012 was up 21% -- helped by the acquisition from Janssen. Lilly sees continued double-digit growth for the coming years. The company has no plans to spin off the unit as Pfizer recently did with Zoetis. Much of Lechleiter's 2011 speech focused on innovation and the company's pipeline. He voiced confidence that Lilly's continued innovation would help it overcome the difficulties of the YZ years. The company certainly has plenty of drugs in the pipeline, with 13 candidates in late-stage trials and 49 drugs in phases 1 and 2. Some drugs approved over the past couple of years appear to have good revenue potential, particularly Tradjenta for patients with diabetes. However, Lilly has also experienced setbacks. In December, the company discontinued one of three late-stage studies of experimental rheumatoid arthritis drug tabalumab due to disappointing efficacy results. A few months earlier, Lilly announced that solanezumab failed to meet primary endpoints in a phase 3 study targeting treatment of Alzheimer's disease. However, the company is moving forward with another late-stage study of the drug in treating patients with a mild form of the disease. The theme for Lilly's 2010 annual report and its CEO's early 2011 speech was "Getting There." Can the company legitimately claim to be getting there now that it is halfway through the YZ period? If we only look at the stock performance, we would probably answer affirmatively. Lilly's shares have done well so far. However, I don't think the company's YZ strategy will be enough over the next couple of years as it loses patent protection for Cymbalta and Humalog in 2013 and Evista in 2014. The three drugs combined for sales of $8.4 billion last year. Lilly's pipeline could pay off, but not quickly enough to cushion the blow of these coming losses. My view is that the company needs to modify its stance on acquisitions somewhat. I don't think Lilly needs a megadeal, but spending some of its $6.9 billion in cash to buy a smaller company seems to make a lot of sense. That would be a wiser approach for the remaining years YZ in my opinion. And it would be fairly "EZ," too.